This 3,400 sq. 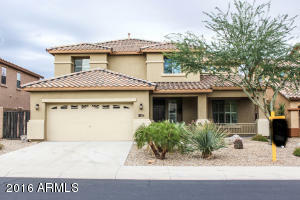 Ft., Five bedroom, four bath home in sonoran mountain ranch is a real beauty! With two master bedrooms, one up and one downstairs and three additional bedrooms, it?S an accommodating floorplan! Freshly painted, new carpeting, wood floors and tile, and ceiling fans throughout are just a few of its awesome features! A patio at the front of the home enhances the feel of this standard pacific home. From the entryway you can see the formal dining room with plantation shutters, hallways to the greatroom or to the downstairs bedroom #2 and a full bathroom. The kitchen boasts corian countertops, upgraded maple cabinets, a breakfast bar, an island, stainless steel appliances including a gas range, microwave, dishwasher, a large pantry and a bay window at the eat-in kitchen area. Directions: Start From 67th avenue & happy valley rd. From there, go N on 67th ave to sonoran mountain ranch rd and turn l; turn l onto w caleb rd and r onto n 71st dr; l onto w ashby dr and the property is on your l.